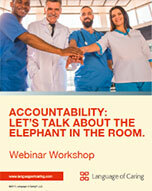 Accountability is often the difference that makes teams, initiatives, and strategies successful. To achieve breakthroughs with our different strategies and initiatives, we need to establish, communicate and enforce higher standards that will bring the best out of our staff. In this compelling webinar, Dorothy Sisneros and Kimberly Carson describe what it takes to raise the bar on employee performance. They illuminate the leader’s key roles in accountability and share concrete tools you can use to move your employees to a higher level. Kimberly Carson, M.Ed., Director of Client Services at Language of Caring is a dynamic organizational psychologist. She helps healthcare leaders engage and inspire providers and staff to strengthen processes and practices key to a truly caring culture and consistently excellent medical care. Her expertise includes program design and facilitation, leadership development, and organizational development.